Having a central heating system that you can rely on is essential to keep your home feeling warm and comfortable. As a long-established firm with experience of central heating installations in Harehills, we have built up a reputation for providing a friendly yet professional service. 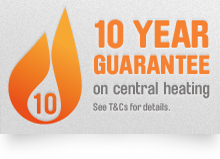 We know that installing central heating in your home can be both daunting and expensive! Whether you would like to update or replace your existing heating system or want to install a brand-new system from scratch, we’re happy to offer free and unbiased advice and information on the best system for your home. If you are looking for a specialist to install central heating in Harehills, here at Tuke Heating our services are available to home owners, businesses and landlords. We pride ourselves in offering unbiased, realistic advice on the different central heating systems and boilers which are currently available. Our expertise covers most makes and models of boiler and our services are regulated and accredited to ensure the safety of our customers at all times. We can supply and fit Worcester Bosch boilers which have an excellent reputation for reliability and come with an unbeatable warranty of up to ten years. Regardless of the size or scale of the project, we guarantee that our engineers will carry out their work to the highest standards each and every time. Here at Tuke Heating we offer an unbeatable combination of in-depth product knowledge and industry-wide experience with the expertise to install state-of-the-art heating systems. As energy prices continue to rise, we know that saving money on heating bills is more important than ever. This is why we’re happy to advise our clients on a range of energy saving devices, designed to improve the performance of your heating system and help you reduce your heating bills. Choosing Tuke Heating is a great way to ensure your boiler runs efficiently and reliably and we offer a number of boiler service and central heating maintenance and installation packages, designed to help you reduce your energy costs. So why choose Tuke Heating? We are a family run, local, established business with a reputation for offering reliability and exceptionally high levels of customer services. From the start of every job through to the finish, we work hard to make sure our clients are 100% satisfied with every single aspect of our service. For further information on our services for the installation, repair or servicing of central heating in Harehills, please get in touch – we’d love to talk you.